Kuwait’s global culinary offerings continue apace. The latest eatery to catch our eye is Ubon in the Sabhan district. The restaurant’s setting – overlooking a field, man-made lake and horse-racing track – may not immediately bring the mind the swaying romanticism of its namesake, Ubon Rachathani, an ancient city in Thailand’s eastern provinces, but it’s the architecture that ably sets the mood for something tastefully exotic. 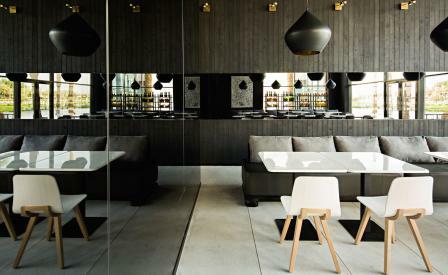 The restaurant rises about the flat desert landscape in the form of a slick white cube fringed by ponds and palms. To break the monotony of the shape, architects Rashed Alfoudari and Dawood Albader have inserted towering glass windows that pull light into the shaded interiors. Here, charred timber walls are played off against light grey-pebbled concrete, black mirrors, brass joinery and furnishings by French brand Alki. The effect is of stepping out of the glaring Arabian heat into the welcoming cool gloom of an expansive tent. Meanwhile, the menu is Thai-lite; one gets the impression that the goal is not to stray too far from the tried and tested formula set by the original Ubon in Kuwait City. And so, diners are gently steered through familiar favourites like tom yum soup, green chicken curry, Massaman beef and red ruby though extra-regional dishes like beef satay, shrimp wontons and shrimp stir-fried with black mushrooms in a lemony garlic sauce, and a soufflé cheesecake are reminders that you’re no longer in Thailand.